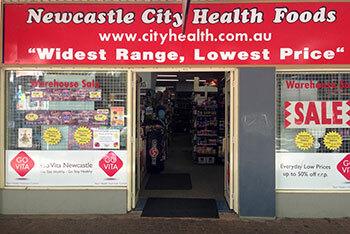 City Health Foods (Go Vita Newcastle) has been Newcastle's leading retailer of bodybuilding supplements, sports nutrition and health products for over 20 years. From our store in the Hunter Street Mall, you'll find Newcastle's biggest range of bodybuilding supplements from top brands including Optimum Nutrition, Max's, Balance, Muscletech, Amino Nutrition, Vital Strength and many more. If you're looking for discount whey protein or the latest in pre-workouts we'll be able to help you out. If you're looking for a supplement store in Charlestown, Kotara, Merewether, Mayfield, Glendale, New Lambton or any other part of Newcastle, Lake Macquarie, Maitland or Port Stephens it's just a short drive to the largest selection in the Hunter Region. Can't get to the shop? No worries we offer free shipping ($9.95 if order under $100) to the local area and deliver supplements around Australia. Visit our friendly staff at Shop 2, 146 Hunter Street, Newcastle 2300 (opposite Subway in the mall) or give us a call on (02) 4929 2809.